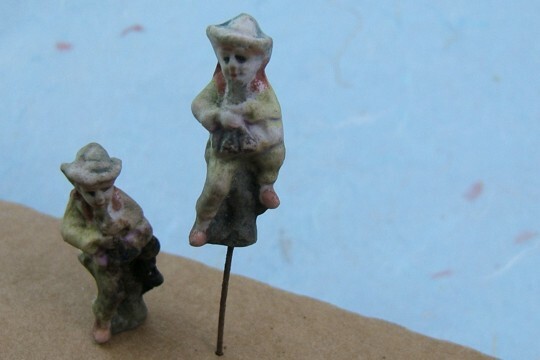 We think that these little fellows were created originally for setting up miniature scenes for railroads or Lilliput villages, but we are really not sure. Some of them have an original metal pick in the bottom - probably for positioning in your diorama or display. We prefer them without the picks and most stand on their own. But we've not changed any of them. Each of these fellows is sitting on a log and we cannot really interpret their activities. It appears that some might be cowboys (their hats suggest such) and others might be musicians, perhaps even playing the bagpipes. It is difficult to see the detail in the log, but it is quite nice for something so tiny and old. Each figurine was hand painted and the paint shows some wear. We're showing 2 samples so that you might see the differences. We love the true patina that only real time offers such pieces. Each piper measures about 1-1/4 inch high by 1/2 inch wide and about 3/8 inch from front to back. When there are stems, they vary in length, most being a bit over 1 inch. These are lightweight, making them perfect for even altered art jewelry projects. We expect that these are from the 1920s through 1940s, but we've not been able to find a date on any of them. Some are marked with their country of origin, Japan. These have been dusted off, but the metal, if any, is rusty, so please be careful. We never clean any vintage or antique items completely so as to not ruin the value. We've never seen anything like these before, so we are quite delighted to offer them to you. We're showing you two sitting figures for illustration. Please let us choose one for you.